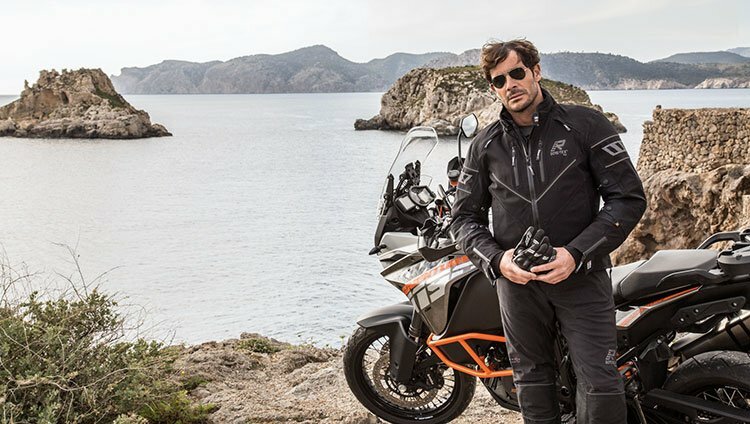 Helstons is a rather superior maker of leather motorcycle wear. 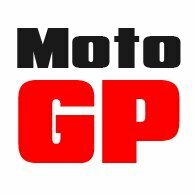 They manufacturer what we consider to be the very finest leather motorcycle jackets. Their jackets are incredibly soft with lovely, very authentic vintage finishes that are so much nicer than you get on most retro-styled jackets. Yet you still get thermal liners, waterproof membranes and full body armour, including a back protector as standard. Their gloves are equally impressive. In the Helstons range, there are a number of boots, but one of the most impressive styles is known as the the Basket and, as the name suggests, it is somewhat based on a basketball boot, albeit a rather special one. It is made from soft calfskin, and is lined with the same. It has a gear change protector, and has been treated for waterproofing. We’ve been out of stock of the Basket boots for quite some time, but this week our shelves were replenished, and we now have all three colour ways in all sizes. 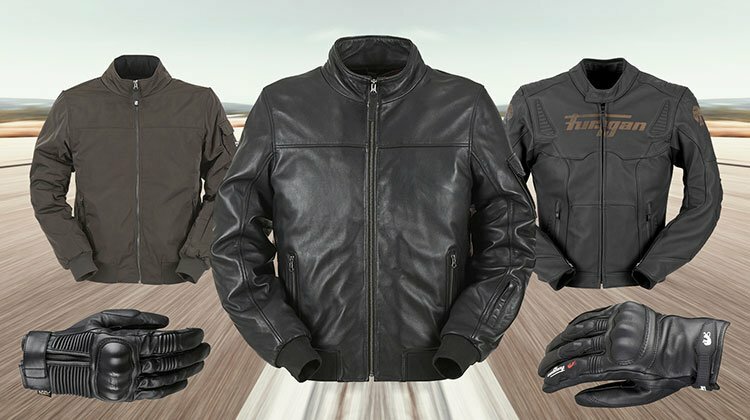 In the last week we have received a number of new items from French producer Furygan; specifically three new jackets and two new winter, leather gloves. The jackets are the Freddy, the Fury Sherman and the Malcolm. The Freddy is a beautiful leather jacket very much in the style of those worn by American pilots in the last war, complete with ribbed cuffs and a shoulder pocket. The Sherman is a sportier model with stretch panels throughout, and a traditional Furygan logo across the chest. The Malcom is a textile jacket modelled on the Harrington style of jacket worn by Presley, Steve McQueen and Sinatra in the sixties. The two gloves that have arrived are the TD21 All Season and the James D3O All Season. Both are versions of existing styles, and come with waterproof membranes and knitted linings for warmth. Furygan is one of the great European brands. We have selected from their range only our favourite styles for 2018. These new jackets and gloves form part of the company’s new autumn collection. They are all in stock now. It occurs to us that Rukka might have shot itself in the foot when it launched the Nivala about a year ago. And that’s because it’s so superior to every other suit in the Rukka range that nobody really wants anything else. It’s probably in recognition of this that Rukka has decided to discontinue its two other key suits, the Armaxis and Armaxion. They were far less comfortable to wear, less fitted and nowhere near as well ventilated. The Armaxion was particularly poor in this respect, but it won’t disappear completely, however. It’s being rebranded as the Armascope; it will be available through one of the big chains. A laminate motorcycling outfit, we would suggest, is not for everybody. Yes it is more waterproof than a drop-liner suit, but it’s over the top for the occasional rider and, for many, the expense will rule it out as an option. But if, after deliberation, you convince yourself that you do need a laminate jacket and pants, you won’t find a pairing that’s nicer and more comfortable to wear than the Nivala. The issue that we have had is keeping them on the shelf, and clearly it’s a problem that Rukka itself has experienced too. For a couple of months we’ve not had a full compliment of sizes in both the jackets and pants. A few weeks ago, we got a delivery of jackets in. This week we have had some trousers turn up. One thing we would say is that if you’re thinking about the Nivala, you need to be fitted by somebody who knows what they’re talking about. The jacket, for example, will almost certainly be one size down from any other Rukka jacket. Because of the stretch in the fabric, it fits far more snugly than other jackets. In fact, it fits more like a leather jacket than a textile one. On the trousers, there are long, short and regular length legs, and you need to make sure you get the right length for your bike. A Nivala is an expensive suit. It’s an investment in your riding pleasure, but you want to make sure you don’t get the wrong size. The good news is that we sell more Nivalas than anybody else in the country. We know the suit better than anybody, and we have on our shelves more sizes than anybody. If you’re serious, it might be worth finding the time to pay us a visit. We have to be honest here; half the people who come into the shop turn their noses up when we suggest that these are the warmest gloves they’ll ever ride in. We get all kinds of comments along the lines of not wanting to look like an extra from Star Trek. But the truth is that a mitten will always be warmer than a fingered glove. If you’re a skier, you’ll know this to be true. They work because they allow warm air from the skin to create its own micro climate inside the glove. Wear a set of silk liners, and they’ll be warmer still. 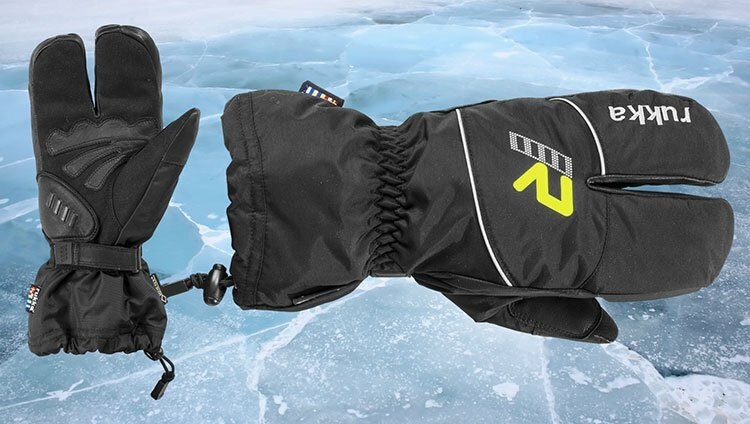 For waterproofing, the Rukka 3-Finger has a Gore-Tex membrane. The upper side of the glove is pretty much entirely textile so will provide a barrier that will stop rain soaking through and passing inside the glove. The palm, however, is leather for better grip and feel on the bars. For warmth, the gloves are well padded, and the interior is fleece lined for extra comfort. This is a brand new model for Rukka; it differs from the previous model in only a few respects, but one of them is a softer scaphoid protector that won’t interfere with the grips, in a way that the hard protector did on the previous model. Lastly, there’s a really useful visor wiper on the left hand, and if you do a lot of riding in the rain you’ll know just how useful this is. So the bottom line is that if you want to stay warm on the bike, accept that riding a bike in inclement conditions is not a fashion parade. You can choose to look cool, but this could well mean you’ll end up with cold hands. The choice is yours! Not really, one might imagine, the right time of year to be buying goggles, but that doesn’t seem to be having an effect on the demand for Ethen’s two rather cool styles. We’ve had problems keeping up with demand, and they’ve kept selling out. So for Christmas we've bought big. Our delivery turned up this week. Now the guys and girls at Ethen do lots of different goggles, but we’ve very much homed in on two models that we really like. These are the Café Racers and the Scramblers. The Café Racers are particularly interesting, in our opinion. They are basically frameless. The strap velcroes (very securely) into the edges of the lense. A layer of foam then goes around the outer perimeter of the lease to create a tight seal around the face. But because there’s no thick plastic frame around the goggles, you get a large viewing area for the size of the goggle. 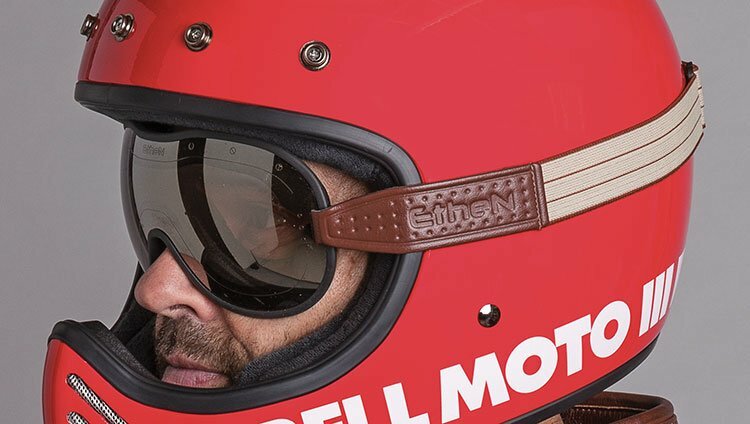 They work well, and fit really neatly on not only on an open-face helmet, but also into the face frame of the cool, full-face helmets like the Bell Bullitt, Moto 3, Blauer 80s and so on. They’re a modern take on a classic look. We like them a lot. The other goggle that arrived with the Café Racers is the Scrambler. The Scrambler is more overtly ‘old-school’. It has much more of a classic, Stirling Moss profile, but it is actually much smaller and more compact than most of the traditional looking, 1950s' frames. What’s really nice on the Scramblers is the really deep sponge inside the frame. This means that, almost whatever helmet you wear, they will seal properly with the contours of your face. The lenses are also clever; they’re ‘reactolite’, so they darken in the sunlight. First time we’ve seen that on a motorcycle goggle. Obviously both styles are now on the shelves. Historically, helmets like this have not really been made available to the European market. They have tended to be DOT approved only, and sold exclusively in the US. You could often buy them in the UK, but in an accident you might have found yourself uninsured and, truth be told, some DOT helmets are such poor quality that you wouldn’t have wanted to ride a bicycle in one. And so we were delighted when, quite a few months ago, Bell announced that it would be importing their new Scout Air into the UK. Obviously, it’s what is known as a ‘shorty’ helmet, but that doesn’t mean it’s been done on the cheap. This is a proper, sophisticated, open-face helmet with lots of trick features that you would normally never expect to see on this style of lid. The first point to make is that it comes in no ness than five shell sizes for a super low-profile fit. Bear in mind that even the Schuberth C3 Pro only has two shell sizes, and it becomes clear that Bell has gone to some lengths to make this helmet work. The fit is better than it is on most Bells, and it really does look small when you’re wearing it. A bowling ball this is not. The shell itself is of TriMatrix construction, which means that it’s made up from a mix of aramid, carbon fibre and fibreglass fibres. The result is a helmet that comes in at just 900 grammes, which must surely make it one of the lightest legal helmets on the market. To improve the fit, if it’s necessary, there are four different sizes of cheek pad that enable one to tailor fit the helmet to your particular head and face shape. In the box of your Scout Air, you’ll find a removable peak. With this peak removed you can very cleverly insert a full-length visor into the front of the helmet. It keeps the visor very firmly in place, and you can choose between a clear one and dark smoke alternative. All in all, the very nicest shorty we’ve come across. And finally it comes in three rather muted colours; shiny black, matt black and matt titanium. The Nexx XG100R. Is this the best of the retro helmets? 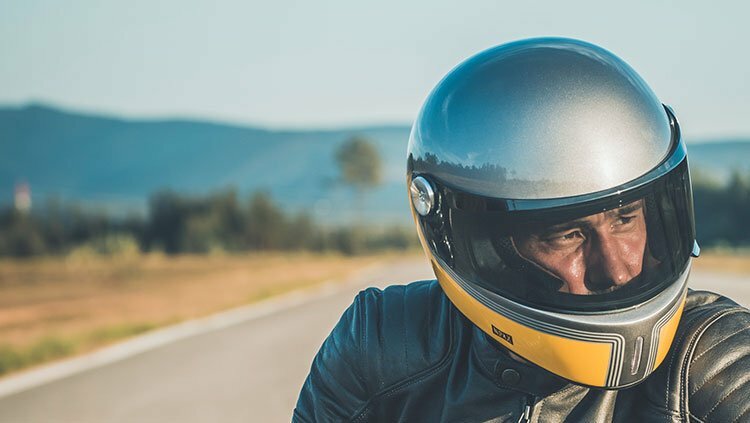 For some time now, we’ve been looking for the perfect, retro-style helmet; the kind of lid that you can wear on a Bonneville, R-Tine T, Scrambler or custom bike. There are a few options out there already, but they’re nearly all compromised. Some look great, but are ridiculously overpriced. Others fit like a metal bucket, whilst some don’t need ventilation because there’s a huge gap all around the visor that makes vents redundant. Well the new XG100R from Nexx is probably the nearest we’ve had yet to a helmet that delivers both form and functionality in equal measure. The starting point is a perfectly smooth and round shell. This it shares with the non-visored XG100. But for a better fit, the new version comes in two shell sizes. But the big upgrade for the 2018 model is a proper, lift-up visor. Now with most retro-looking helmets, water ingress is a secondary consideration, but the Nexx XG100R has a proper visor that works. It stays in the open position when you raise it, and it doesn’t let water in. In fact, in this regard, it’s pretty darned impressive. We have a standard rain test here that we apply to all new helmets, and we can tell you that the Nexx performs better than many serious, commuter helmets that cost twice as much. Truth be told, it’s still not quite what we’re looking for, but until Arai, Shoei or Shark wake up and smell the coffee, we reckon this is as good as it gets. It’s certainly better than some of the helmets that have been presented to us recently, and which will be coming through in 2018. And what’s more, the price is more than reasonable. We would still suggest that for commuting and long distance touring there are better options. But if you’re after a cool-looking, weekend helmet that will look right, fit right and perform right on the kind of bikes we’re talking about, the XG100R is well worth a look.